These are the Law specific DS-Print setup instructions which will allow you to print from your laptop directly to the MFD machines on Floors 1, 2 and 3 within the Faculty. The instructions provided in the below guides you through the installation from start to finish. 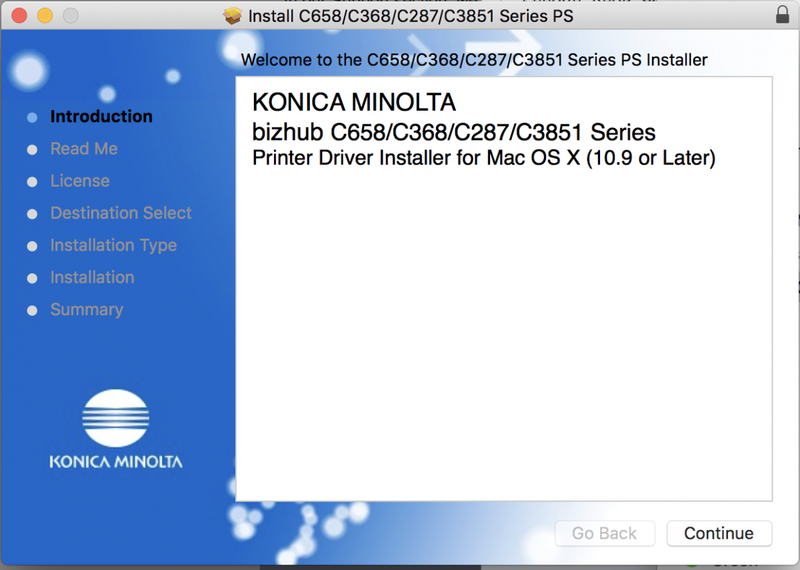 The images are based using Mac OS X 10.12 and uses Konica as an example of installing a print driver..
1. 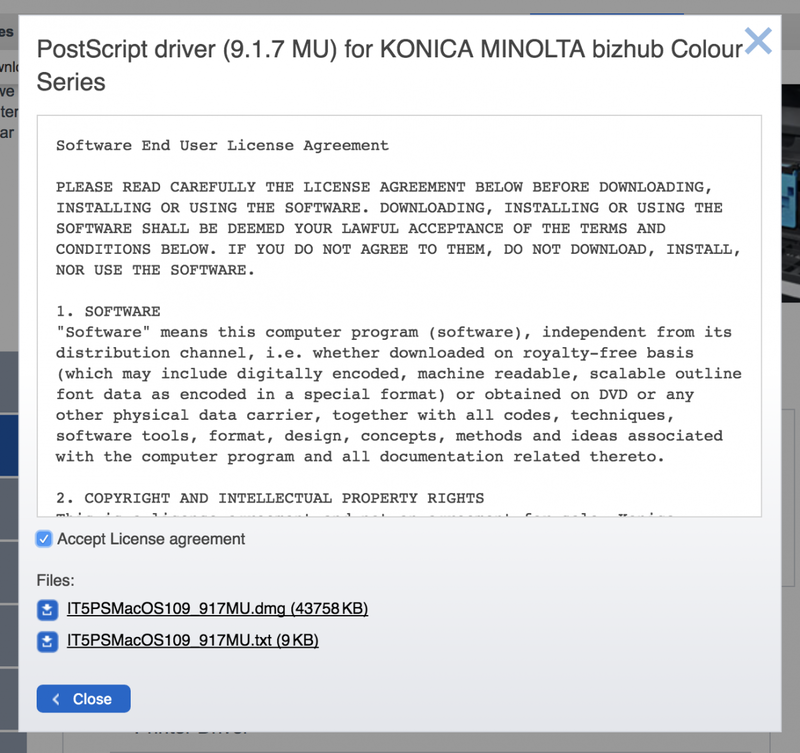 Download the print driver for Mac from Konica Download Centre. 2. Read and Accept the License agreement and download the .dmg file. Once downloaded, run the dmg file and this will install the print driver on your machine. 3. From "System Preferences" choose "Print & Scan". If required click the locked padlock and authenticate. 4. Click + to add a printer. 5. Click on the 'Advanced' icon. Set the Type drop down to "Windows printer via spoolers". Tip: If the Advanced tab is not shown in the toolbar then right click in the toolbar, choose "Customise Toolbar" then drag the Advanced icon into the toolbar. 7. Set Name field identical to the print queue name, don't use any spaces. 8. Select "Select Printer Software..." from the "Use" drop down. Choose the correct driver (KONICA MINOLTA C368 PS) from the list. Using the search box makes it easier to find a specific driver from the long list. 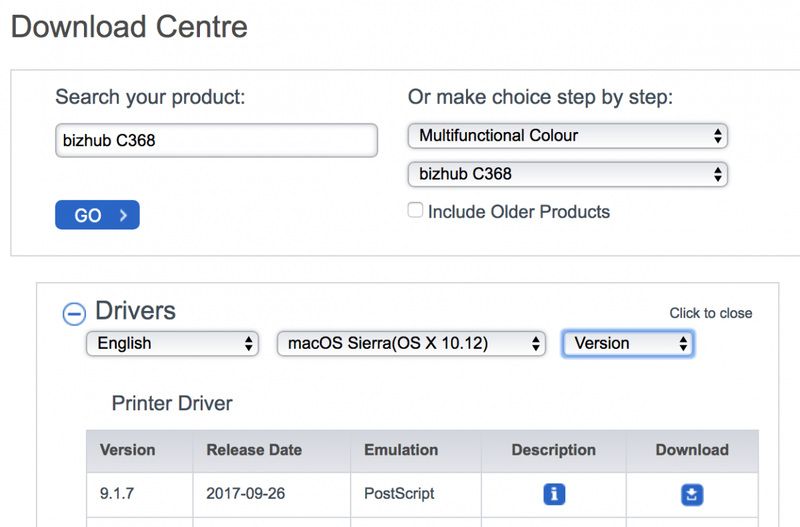 TIP: If the driver cannot be found in the list, you'll need to install the driver further. Click on the dmg file that's been mounted (see image below). Open the letter folder to find the pkg file - double click to install. Run through the install process. When you are able to select the driver, accept the presets to continue setting up the printer. 1. Print your document using the usual method from within the document's application. You will be prompted for authentication, enter your Desktop Services (also known as MCS) username and password or UIS credentials as shown below.